The first night, I wish a good rest after the hard days that I had with a lots of muscles pain. For 35 $ a night, shared room with noisy roommates, a foam mattress and sleep in sleeping bag, wasn't satisfying. $ 15 to put the tent underground, with showers, toilets and barbecue ... it was reasonable. It was offering me several meals at John's pizza bar, and once at the bakery ; What regale ! I can't count the delicious milk teas we was offering me too. Pizza, Hot chocolate, yogurt, milk, tea.. Feels good ! I woke up and started to ride when I felt that the wheel has a very strong regular friction. I didn't know where it come from absolutely, Harry spends at the right time and told me that I have a broken spoke, I then discovered the use of the spokes ! He tries to fix it, not any more friction but still has a few centimetres near .. There is no bike shop here, Harry puts the bike in backlog of his pickup and took me in different places to find a solution, nothing ... I start to stress... but finally I was reassure, the wheels was not straight but don't rubs any more, so I will fix in Alice Springs. Later, my left pedal goes a squeak very strongly, and I didn't have the tools to repair, but no worries, the Residents are so helpful and a man from a service station help me to fix it backed up by Andre. - Front of the shop, I first met Steve, An aboriginal of 37 years, kind and friendly, I asked him to teach me the first two words you need to know in his own language: PALYA(Good, yes, welcome..) and WIRE(no). After, he gave me his sandwich with insistence and suggest to stay in his house underground, but I refuse explaining that as a single woman, there are things I can't accept. He understood and was very friendly the other times. 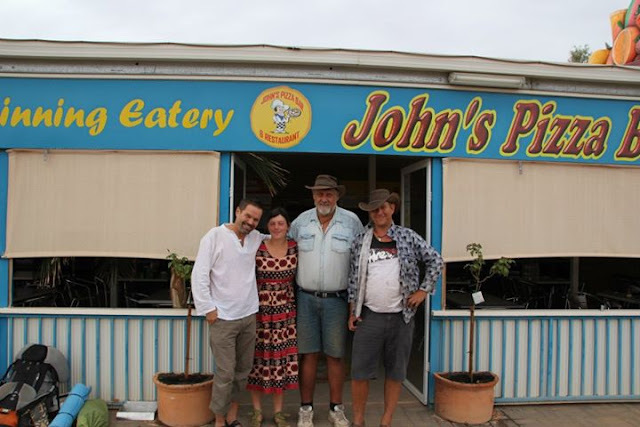 - Harry and Will, 2 Australians of passaging who have some forty years old and offered me to join them at 6 pm at John's Pizza Bar for offer me the dinner, and suggest to camp with them. I met a man from Finland and I see again Jacob(the American who hitchhike, I met on the last rest area before CP). We join all together to share pizza with Harry and Will. It was very nice! - A man who lives in a caravan south of C.P while building his own underground home. He showed me a dingo longer watching us, then he told me that this is a Dingo, have sores and remaining around the city for food and come over here usually. First time I saw a Dingo ! He offer me to stay safely in his place any time I wish. Then, I go to the discovery of Opals Shop by curiosity, but also to meet the locals ! Pleasantly surprise, several welcome friendly, some, invite me to join them to sit and take tea. Some have also offered me of Opal pendants, appropriate remembrance of the town. - Peter from the Mobil Service Station was very impressive, enthusiastic and very generous, he give me a lots of energy and encouragement. - Greek people, lots of Opal miners/shops from Grece in Coober Pedy. 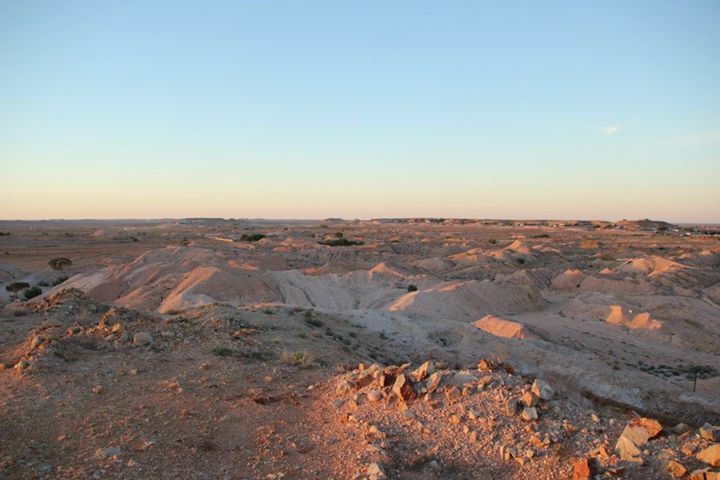 Approximately 150 million years ago the ocean covered the Coober Pedy region. For thousands of years the Antakirinja Matuntjara Yankunytjatjara People belonged to and walked across this area of land. In 1975 the Aboriginal Community adopted the name “Umoona” meaning long life. Today with a population of approximately 3,500, Coober Pedy has one of the most multicultural communities in Australia with an estimated 45 nationalities. Whilst living conditions were harsh with water and provisions being carted great distances, today the town water supply comes from an underground source 24 kilometres north of town. The water is pumped through an underground pipeline to the water works where it is treated by reverse osmosis. 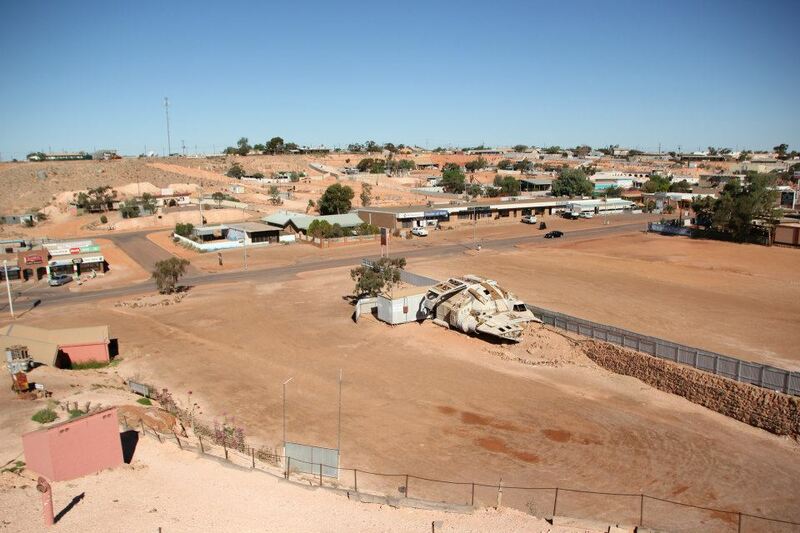 Coober Pedy caters to all and is a place unlike anywhere else. The Opal – Coober Pedy’s passion In 1915, the New Colorado Gold Prospecting Syndicate, consisting of a Mr. Jim Hutchison, his 14 year old son William, a Mr. Winch and a Mr. McKenzie had been unsuccessfully prospecting for gold out here in the middle of South Australia. The young lad, Willie had been left in camp to look after their supplies but disobeyed orders and wandered off to search for water around the foothills of a nearby range. There was a degree of apprehension among the men when he failed to turn up after dark. But a short time later, he strode into camp with a grin on his face. Over his shoulder was slung a sugar bag full of opal. Now this was a very fortuitous find for the young William – not only did he come across the opal, but he also discovered something equally as precious out here – a supply of good fresh water. This was on the 1st February 1915 - 8 days later, they pegged the first opal claim. 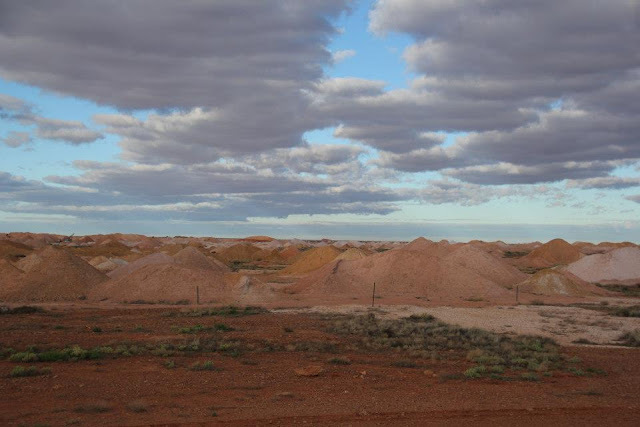 The catalyst for Coober Pedy’s existence had been discovered. Word of the find spread quickly and by the middle of 1916, miners had moved to the area. Young Willie did not live long enough to see the fruits of his discovery. He drowned five years later while driving cattle across the Georgina River, on the Birdsville Track. Construction workers from the trans continental railway, followed by soldiers returning from World War 1 came to the opal fields. They introduced a unique method of living underground in "dugouts". It’s claimed these soldiers, come miners, were used to digging and living in trenches, they knew the advantages to be found in the even cool temperatures of the dugout. 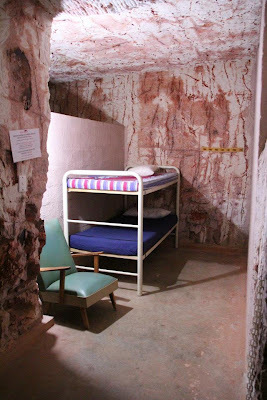 Given Coober Pedy is one of the hottest places on earth to live, it only seemed logical. Several major discoveries continued to be made, so in 1920 the local Progress Committee decided that the field should have a proper name. After much deliberation the choice fell on Coober Pedy. The most widely accepted translation is thought to be the Aboriginal words Kupa Piti which loosely means “White Man in water hole”. Water – Coober Pedy’s problem I’d suggest that many of the miners wished they were in a water hole. Lack of water, which often had to be re-used many times before being discarded, was always a problem in Coober Pedy. Water and provisions had to be trucked in great distances, under incredibly difficult conditions. The water problem became so bad that in 1924 the Government decided to build a 2,000,000 litre steel water tank to catch a bit of rainfall runoff. The only problem was, there was no rain until 1925 to put any water in the tank. The town got a much more reliable supply in 1985. The water supply now comes from an underground source 24 kilometres north of the town. The treatment and pumping process make this some of the most expensive town water in the world. Field of dreams The 1950s miners began experimenting with the open cut method of mining and then in the 60s, all mines became increasingly more mechanised, with blowers and trucks, conveyer belts – shafts that got deeper – down to about the 30m level. Interestingly large companies have never operated in the area. Mainly due to the fact that a miner can only take out a lease of 50 square metres and then they’re obliged to operate for 20 hours a week. Some argue that this has slowed progress in the town. Development has come a distant second to the need to find opal. The Dog Fence But in amongst the mines and the mullock heaps, runs one of the lesser known achievements of the modern age, the longest man made structure in the world. It stretches 5,614 kilometres. It was established in 1946 to keep the Dingo away from the merino. The fence begins east of Surfer's Paradise in Queensland, and ends up north of Ceduna in the Great Australian Bite. Back in 1989 vast tracks of it were washed away in the floods. They reckon 20,000 sheep were killed by dingoes while it was down, which gives you a fair idea what happens when they do get in. The economic benefit of the fence far outweigh the disadvantage. Quite frankly - no fence, no sheep. Being underground During the 1960's, the mining industry expanded rapidly due to the many European migrants who came to seek their fortunes. 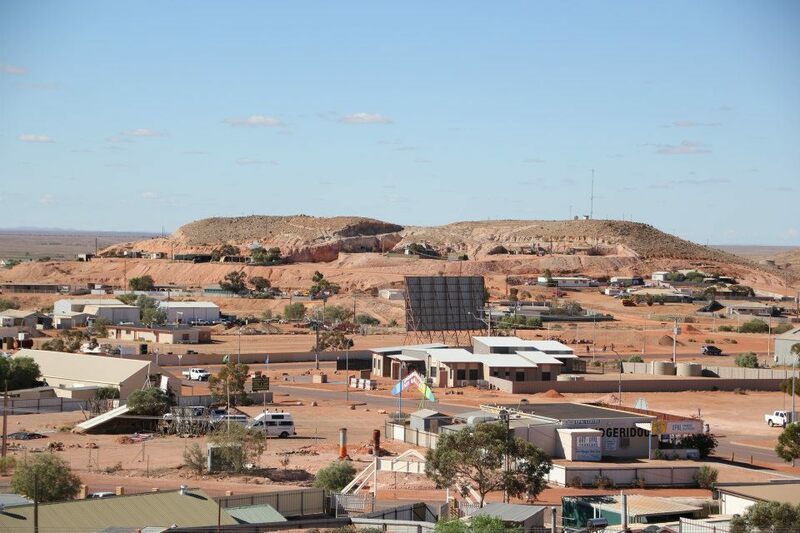 There were over forty different nationalities in Coober Pedy which created a few dilemmas. When it was decided to build a church in the 1960s the idea was to build one church shared by all. In true pioneering spirit, everyone pitched in to build what is believed to be the world’s first underground church. 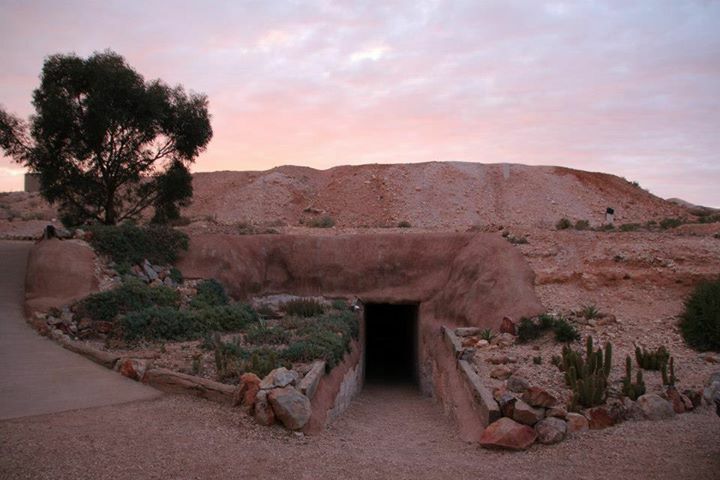 Opal fever has ensured that Coober Pedy continues to attract unique characters, all of whom have been seduced by the glow of a great opal. Various levels of professionalism are required to find opals. But if it’s your time, then the opal gods will shine. And it’s that “special feeling” that a hidden treasure lies just behind the next layer of rock that keeps bringing people to Coober Pedy. It’s definitely an Australian icon town and it’s all about the opals. The first purpose built Underground Catholic Church of its type in the world opened June 25 1967 and extensions completed September 1984. 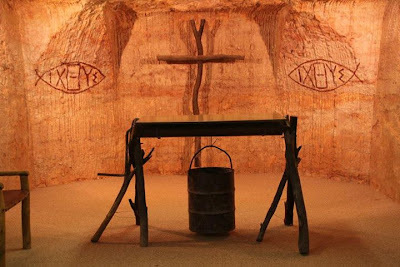 It still remains Australia's only purpose built underground Catholic Church and is classified a historical site in Coober Pedy, South Australia. Special features of the church include the bell tower, St Anthony's Window, the Jasper stone altar and sanctuary, and the Holy Picture of Marija Pomagaj. 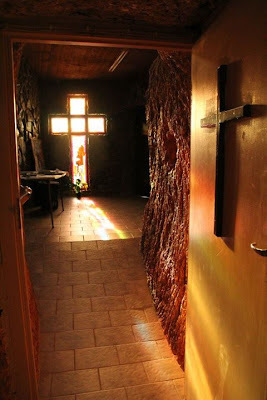 A unique church, Catacomb Underground Church was dug out in the mid 1970s and dedicated by the Anglican Church thereafter. It is very quiet and a great place to meditate, pray, or just sit and be still. There is a regular Sunday service with an average attendance of 40 people from nine denominations, and visitors are most welcome. The interior of the church is natural rock, coated with sealer to stop it getting dusty. It features an actual windlass from an old mine site, and two Caldwell drill holes that open to the sky. These help give visitors an idea of what it is like from the base of the two million-odd holes around Coober Pedy. The temperature in the church is 24 to 27 degrees Celsius all year round which is one of the reasons why so many people live underground. The Serbian Orthodox Church in the South Australian outback opal mining town of Coober Pedy has the very unorthodox distinction of being underground. But despite a slowing in the region's fortunes, the community says the church is far from buried. “We're keeping the maintenance, it costs us lot of money, lot of effort, but thanks to the community of the Serbian people and thanks to all other people because other Australians come help us,” said Milomir Belosevic, President of Coober Pedy Serbian church. "German, even Croatian, Muslim, everybody we ask to help us they come to help us." The window that appears ground level on the outside actually soars 20 feet over the church within. With its stained glass windows, dirt walls, and ornately carved statues, the church may well be from biblical times. But perhaps more telling of the church’s age is the portrait of Ratko Mladic which hangs unassumingly in the church hall. The Bosnian Serb and former military leader is being tried for war crimes and crimes against humanity. "He's in the prison now but he still is not find guilty, therefore we cannot judge. Let the court judge it," Mr Belosevic said. There were hopes that the massive excavation for the church and hall may pay for itself with an opal find, but that hope has been dashed. “We don't find nothing and we still stayed working voluntary and for nothing,” said Stojan Garlic Treasurer of Coober Pedy Serbian Community. It turns out tourists are the windfall. The church charges tourists $5 per person to support renovations and the ongoing running of the church, and these days, there are more visitors to the church than parishioners. Since its priest passed away a few years ago, locals unable to find a replacement have conducted their own services. Priests are flown in for special occasions such as the anniversary, to be graced by the Serbian Patriarch from Belgrade. It's expected to attract thousands from across Australia. The community's now striving to create St Elijah Park with more than 600 fruit trees to mark the event. Located in a beautiful desert garden, is Faye's famous Underground Home. The original one room home housed the first mail truck driver over sixty years ago. It was converted by Faye Nayler and two other women, using only picks and shovels, into a kitchen and bedroom. Later five other rooms were added including a wine cellar and a swimming pool. Ah les plaisirs du dortoir ! C'est clair qu'il vaut mieux réfléchir à deux fois avant d'accepter une invitation. Si tu ne connais pas et que tu souhaite rencontrer des locaux sans te taper des dortoirs et sans prendre de risque (en principe), il existe une communauté de cyclo voyageur qui s'appelle warmshower. C'est le même principe que couchsurfing mais pour les cyclos seulement.